• Convoluted Dough® memory foam core. • Feels like down, no odors. • Adjustable to all sleep positions. 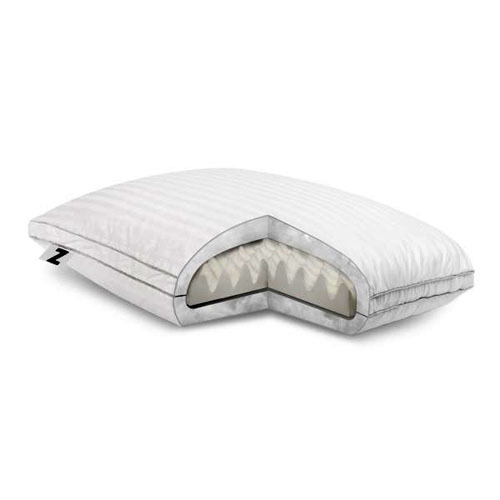 • Removable convoluted Dough® memory foam core encased in Gelled Microfiber®. • Different levels of customizable support for all sleeping positions. • Luxurious down feel without odors, allergens and sharp quills. • 300 TC pure cotton damask stripe cover. Malouf products are drop shipped to you directly from the manufacturer via UPS Ground. Most orders ship out within one business day. ®, at its sole discretion, will repair, replace or refund any pillow that proves to be defective in materials or workmanship. The warranty applies only to the original purchaser and does not cover: (a) wear and tear; (b) damage caused by abuse or failure to follow care instructions; (c) normal changes in soness or resilience ; or (d) stains. Bedding must be returned unused, in original packaging. Money back on returns notified within 7 days of delivery receipt. Buyer pays all shipping costs. Return authorization required. Subject to 20% restocking fee.